An image purportedly of the HTC One X+ popped up Wednesday, giving for the first time a face to the device that's been making the rumor rounds. There's not much to the image, which was posted on the @evleaks Twitter page, other than a basic black bezel, though it does appear as hefty as reports have indicated it will be. What's most noteworthy is T-Mobile's logo emblazoned front and center, indicating a definite carrer for this Tegra 3-packing "superphone." 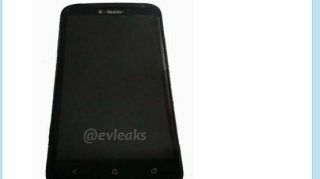 "HTC One X+ for T-Mobile USA," evleaks wrote to accompany the photo, though that's the only suggestion of a country-specific carrier for the phone. Though it's plain on the outside, for this device, it's what's on the inside that counts. If what we've heard about the One X+ so far is true, than HTC has a Twitter leak problem on its hands. Earlier this month, another leaker posted specs for the device. Thanks to those, we learned the X+'s internals don't include any old Nvidia Tegra 3, but rather a Tegra 3+ AP37 1.6GHz quad-core processor. What's more, it will have 1GB RAM and 32GB ROM, as is the case with the current One X, but unlike that phone, it should run the Android 4.1.1: Jelly Bean. We're also looking at a 1,800mAh battery, making this device, if it indeed ever comes, a nice follow up to the well-received One X.